Troy Andrews, a.k.a. 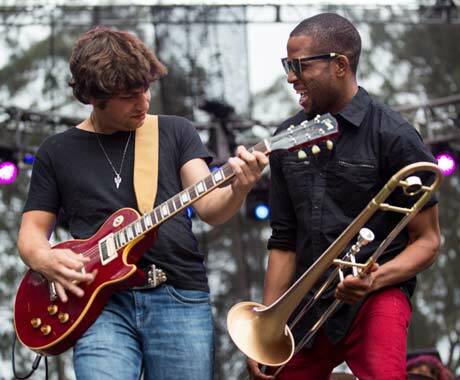 Trombone Shorty, brought his New Orleans-style brass style to San Francisco in a big way. He and his band, Orleans Avenue, steamrolled the audience with a high-energy dose of soul, funk, R&B and jazz. A true band leader, Andrews commanded his band on stage like a conductor, directing cuts to wailing saxophone and drum solos and controlling the time with his hands, his trumpet and his trombone. The Orleans Avenue band, bassist Mike Ballard, guitarist Pete Murano, drummer Joey Peebles and sax players Dan Oestreicher and Tim McFatter are essential to the Trombone Shorty sound and together, they ooze the energy of the Big Easy. Andrews spent a good deal of time introducing band members and hiding off stage while his band showcased their individual talents. Andrews played through "Craziest Things" from 2011's For True and got the crowd into the show with his charming banter. "Ya'll not tired yet are you?" he asked in the middle of the show. "Down where we come from we play ALL night!" They didn't, but judging from the crowd's reaction, they probably could have without a complaint.